Spasmodic Dysphonia is a relatively rare ailment of the neurological system that results in a weak or altered voice. Find out more about the ailment including its types, symptoms, causes, diagnosis, and treatment options. It is a serious medical condition that affects the production of speech due to involuntary contractions of the vocal folds – a pair of elastic muscular bands located within the larynx at the top of the trachea. It is a form of Focal dystonia that affects a muscle or group of muscles in a particular part of the body. The term “Dystonia” refers to a neurological movement disorder marked by involuntary muscle contractions, which leads to uncontrollable twisting body motions or unusual postures. The condition is generally abbreviated as SD. In the United States, the disorder affects only 2% of the population. SD affects females twice as often as males and is most prevalent between the ages 20 and 50. It is the most common type of SD in which involuntary contractions of the laryngeal muscles makes the vocal folds close very tightly, resulting in extreme stiffening. The vocal folds fail to vibrate and lose the ability to produce as well as modulate the voice. Affected individuals have a strangled or choked voice quality. The resulting speech is most often defined as “choppy” and labored. These symptoms, however, are normally absent while laughing, speaking at high pitch, singing, relaxing or yawning. Continuous talking, fatigue or emotional stress can further aggravate the condition. Unlike the first type, the involuntary movements or spasms of the muscles in this form lead to the opening of the vocal folds, thus preventing it from vibrating. In this position, the vocal folds permit air to escape from the lungs during speech. The resulting voice pattern is breathy or whispery. The enormous action of the muscles makes the voice extremely weak and quiet. Similar to adductor SD, the problem disappears when an individual laughs or sings. Professional singers with SD however, may undergo a loss of range or incapacity to produce some notes of a scale. In the third form of the disorder, muscles that are responsible for opening as well as closing of the vocal cords undergo involuntary movements. This leads to a condition that is further complicated and in which the characteristics of both adductor and abductor forms are present. The abnormal movement of the vocal muscles causes a momentary disruption of the voice that occurs occasionally. As aforementioned, the disorder results in a slow, effortful and imprecise speech. The symptoms slightly vary in each type of SD. The symptoms are mild in the initial stages but tend to worsen over a period of time. Recurrent episodes of symptoms transform SD into a chronic condition. The voice attains a tight and strained quality that becomes very hard to interpret. There is absolutely no definite cause for the sudden interruption in the speech pattern. The National Institute of Deafness and Other Communication Disorders has discovered an underlying neurogenic cause that sends wrong signals to the brain and nerves. It is a complicated neurological disorder that causes involuntary and repetitive body movements. The condition affects the muscles of the face, tongue, arms and legs. Smacking, abnormal contraction of the lips and rapid blinking are some of the most common symptoms of the condition. It is associated with muscle spasm that causes the head to tilt to one side and the chin to the other side. Limited neck movement could be related to a serious damage in the brain and spinal cord. The condition may even affect the muscles of the vocal folds. It is manifested by forceful contractions of the face, jaw and tongue. Affected people experience difficulties in opening and closing the mouth that subsequently affects normal chewing and voice production. It is a rhythmic muscle movement involving to-and-fro oscillations of one or more parts of the body. These abnormal involuntary movements can occur in the hands, head, arms, trunk, legs, face and vocal folds. It is an involuntary blinking or spasm of the eyelids. The symptoms of the disorder become more frequent with time, causing recurrent spasms of face, lip and jaws. Patients may have problem while speaking and swallowing food. Medical experts have linked this condition to a genetic component in the body. Disturbance in the larynx and vocal folds is attributable to a defective gene on chromosome 9. Abnormal increase in the nerve fibers of the larynx could give rise to hoarseness, vocal fatigue and reduction in vocal volume. 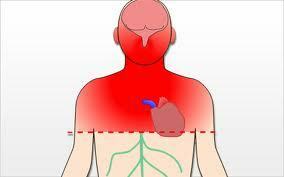 Acute viral infections of the upper respiratory tract could lead to a partial or complete damage of the larynx. A neck trauma or injury may lead to breathing problems and impaired voice production, owing to the sudden disturbance of the vocal folds. 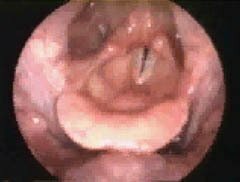 The vocal folds are more vulnerable to voice overuse or misuse, causing extreme voice deterioration. The physician is specialized in diagnosing and treating disorders involving the ears, nose and throat. The vocal folds are examined properly to look for other causes of the disorder. A small, flexible, illuminated tube called fiberoptic scope is inserted into one side of the nose to allow a closer view of the larynx. The procedure is known as fiberoptic nasolaryngoscopy and is beneficial for evaluation of the movement of the vocal folds during speech. The method utilizes an instrument called stroboscope that can make a cyclically moving object appear slow-moving or stationary. The process of endoscopy is used to view the inside of the throat. SD-affected individuals are made to hum or speak into a microphone which in turn activates the stroboscope at almost same or different frequency. 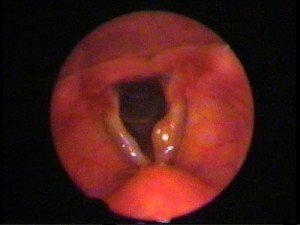 The movement of the vocal folds at different intervals of time can be captured with the help of a camera attached to the endoscope. The therapist conducts a thorough assessment of the voice production and checks for symptoms like low vocal volume, and vocal quality. The presence of any associated neurological ailments can be investigated by a medical professional specialized in diagnosis of disorders affecting the nervous system. Anticholinergics are substances that block the neurotransmitter acetylcholine in the central and peripheral nervous system. Benzatropine is a common drug administered to individuals suffering from SD and has been found to be effective in 40-50% of cases. The approach is useful in treating a number of voice disorders, including SD. It involves vocal and physical exercises coupled with behavioral modifications. It is beneficial to SD patients and helps in relieving the strained feeling in their throat. Small doses of botulinum toxin are frequently injected into the vocal folds by the physicians. In this way, the laryngeal muscles get weakened and produce a louder and clearer voice. Side-effects like breathing and swallowing difficulties may occur, but for a temporary duration. Selective laryngeal adduction denervation and reinnervation (SLAD/R) is a common surgical procedure for treating adductor SD. In this surgical intervention, the selected end branches of the recurrent laryngeal nerve- a branch of the vagus cranial nerve that supplies motor function to the larynx, is excised or denervated. Spasmodic Dysphonia requires timely diagnosis as the condition has a fair chance of turning into a chronic problem. Many therapeutic programs have been tailored to the needs of individuals affected with SD. Certain coping techniques are taught to the ailing patients through proper psychological counseling and guidance.